Bournemouth Airport has reopened after heavy snow fell across Dorset on Saturday causing it to be closed. Most main roads are now clear but freezing temperatures mean many routes are very icy, police warned. A spokeswoman for the airport said it was open but advised passengers to check or contact their airlines before travelling. Gritters are continuing to treat major routes but minor ones are not being gritted and may by hazardous. South West Trains is running revised services and passengers are advised to check its website for information. 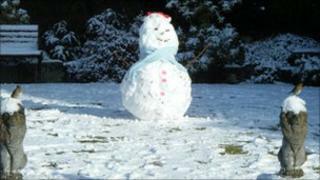 On Saturday, Paul Chaundy, from Blandford Forum, said the heavy snow was not going to stop his sister getting married. He told the BBC: "We've been affected by the snow big time. Today is my sister's wedding day. "We invited 130 guests initially but only 30 people have confirmed that they will be able to attend. "My sister was on on the brink of cancelling because the snow meant they and their guests would never make it to the remote church." But, he said, the day was saved by 4x4s which transported the 30 confirmed guests to the service.